This entry was posted on February 17, 2015 by admin. Many of us are known for eating our emotions, which is why there’s a whole category of food known as “comfort” food. Whether you are feeling sad, lonely, uneasy, anxious, angry or overworked, in times of stress, we turn to our favorite comfort foods to help us cope. Unfortunately our comfort foods of choice are rarely healthy or low-calorie. Too much stress induced eating can quickly take a toll on our health and waistline. So how can we stop the cycle of stress eating? Here are six strategies to try to end the attack on your body. 1. Identify The Triggers: When do you find yourself partaking in emotional eating? Is it a certain mood or time of day? By taking note of when you are turning to food, you’ll begin to recognize what triggers the stressful eating. 2. Experience The Emotion: Don’t numb yourself from the stressful emotions you’re experiencing by stuffing your face with food. By allowing yourself to feel the emotion and let it run its course, you extinguish the power the emotion has over you. The next time you are overcome with emotion, try experiencing it instead of distracting yourself with food. The emotion will eventually subside and you’ll be stronger for it. 3. Don’t Give Food The Power: When you eat in response to a negative emotion, you are giving food a power beyond meeting your nutritional needs. 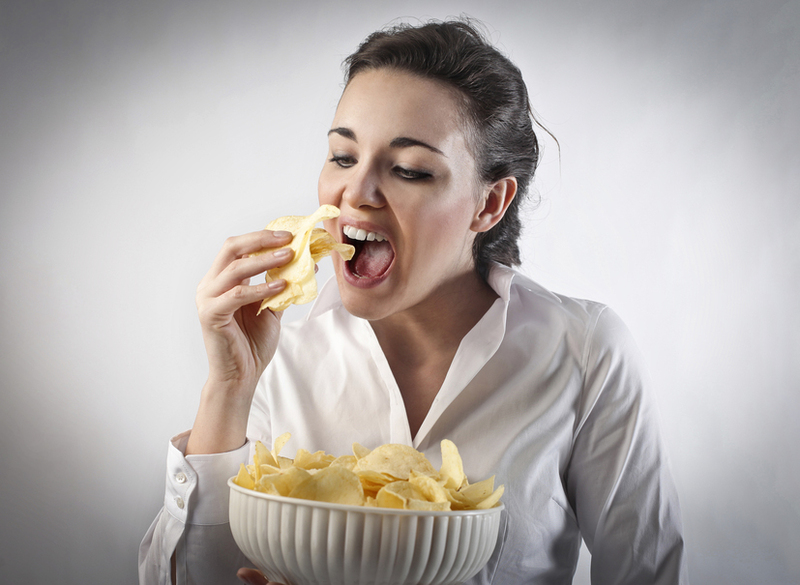 Your ability to cope becomes tied to food, which intensifies your cravings for it. Studies have shown that high-fat and high-sugar foods can affect your brain’s ability to manage stress, reinforcing your dependence on food in response to stress. 4. Find Alternative Escapes: To help manage your stress, find a healthy way to deal with the situation that won’t cause more problems in your life. Instead of emotional eating, try exercise, talking to a supportive friend, or a new hobby to distract yourself from the overwhelming emotion you are feeling. Instead of detracting from your health, these alternatives will actually add to the quality of your life. 5. Pursue Long-Term Success: If life is too stressful right now for you to consider putting down that cookie or bag of chips, you’ll be sorry to hear that there’s never going to be a perfect time to discontinue the emotional eating pattern you’ve created in favor of a healthier lifestyle. As the stress flows in and out of your life, the numbers on your scale will continue to go up and down, or for many, up and up. The secret to long-term weight loss or management is your ability to maintain a healthy lifestyle in the face of adversity. 6. Supplement: Balance Mind & Body is a combination of special ingredients intended to help enhance mood, fight stress and anxiety, improve sleep, calm the body, and support emotional well-being. With SAM-e, DMAE, GABA, Chamomile Concentrate, Ashwagandha, 5-HTTP, B-Complex Vitamins, Calcium and Magnesium, Balance Mind & Body may help stop food cravings brought on by stress. If you are feeling stressed, check with your healthcare provider to see if Balance Mind & Body is right for you. Stop relying on food to ease your stress. Instead, use these strategies as your alternative coping mechanisms to avoid emotional eating. Our lives are chaotic, but these strategies will help you to overcome unhealthy eating patterns caused by the stress factors in your life. Our mission at AndsTrim is to provide our customers with the highest quality of all natural supplements, including Balance Mind & Body Mood Formula. We stock only the finest and most effective supplements, at an affordable price, to assist you in reaching your weight loss goals and overall well-being.